Lisa Hardy is a fine artist living in Wales, taking inspiration from nature and the natural surroundings of her local countryside. Lisa captures and abstracts the essence of her environment with a lightness of touch using a mix of watercolour, pencil and pastel. 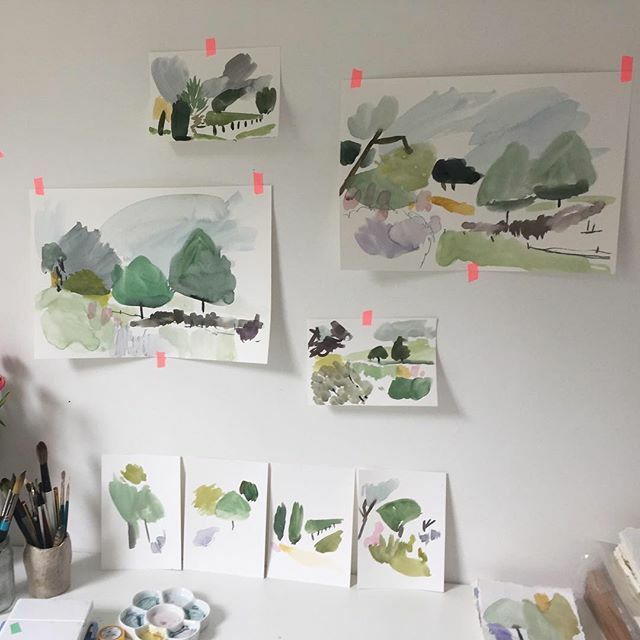 Lisa has a skill for combining beautiful colour pairings with minimalist mark-making, creating organic abstractions that capture the essence of different seasons, scents, memories and flora and fauna that we associate with the countryside. Her work has a soothing and calming effect on the viewer, allowing us to each call to mind a different experience or mood brought about by colours and plants. Lisa Hardy studied at Winchester School of Art achieving a first class honours degree in Fine Art Textiles. After moving to London Lisa began a career in fashion where she worked as a PR Director for top luxury brands. After 15 years in London Lisa and her husband moved to Hastings to tap back into their creativity and where the countryside and gardens in East Sussex inspired much of Lisa’s work. Now living in a converted barn in West Wales, she responds to the diverse beauty in all flora with her unique emotive style of painting and drawing.